iReachAfrica is dedicated to public health initiatives, education programs, agricultural development, and social advancement throughout Africa. We are charting a new course for the nations we serve: "out of poverty into prosperity, out of sickness into health, out of darkness into light." In practical ways we embrace and assist widows and orphans, the hungry, the sick, and the incarcerated. We are a faith-based organization that volunteers and serves without regard to race, creed, gender, religion, or age. Highnam C of E Primary Academy support the great work of iReach Africa in a number of ways. Pupils fund raise to help provide necessary school equipment and recently for a brand new water pump near the school. Resources are created by our pupils and used at the schools in Mozambique and pen pal letters are shared between our pupils. Skype opportunities take place during Collective Worship time and we often will have members of the iReach Africa team visiting Highnam to share updates with pupils and staff. In school, there is an A4 book, found in the entrance area which documents the journey Miss Read has been on. Email received from iReach Africa Education Director Anna Capener. "I am writing with FANTASTIC news! 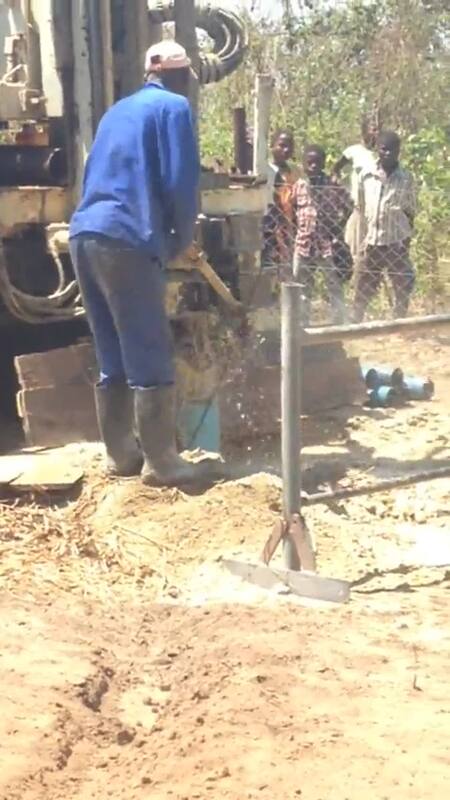 Yesterday the drill rig finally arrived at our school in Chipindaumwe to drill for water. We'd waited such a long time for this day to arrive! After a couple of hours of drilling the depth was at 40m, and the water gushing out of the hole was so plentiful that the decision was made to call it a day. For the first time in the history of this little community there will be clean drinking water! Such a happy day. In a few weeks time there will be a hand pump installed on the hole that has been drilled. Then the local community will be able to come and use the water and we will also be able to use it at the school. The money that you donated has been used towards the cost of this bore hole. So thank you very much all the way from Mozambique!!!" Here is a photo of the first person using the water pump which Highnam pupils helped to fund.